While the monochromatic sneakers won’t violate the league’s footwear color restrictions, the issue is the reflective “3M” heel panel, which the NBA would find potentially distracting for both in-arena spectators and television viewers. Carmelo Anthony faced a similar issue with the metallic chrome heel of his Jordan M10 signature sneakers while playing for the New York Knicks. He later wore an updated version with a matte paint finish. Players are no longer required to wear shoes matching their team’s uniform colors, but the league still has an approval process for new silhouettes from brands in advance of the season. According to Christopher Arena, the NBA’s vice president of identity, outfitting and equipment, companies will typically submit sneakers for the first half of the season by early August, with shoes scheduled to be worn after the All-Star break required for approval by early December. 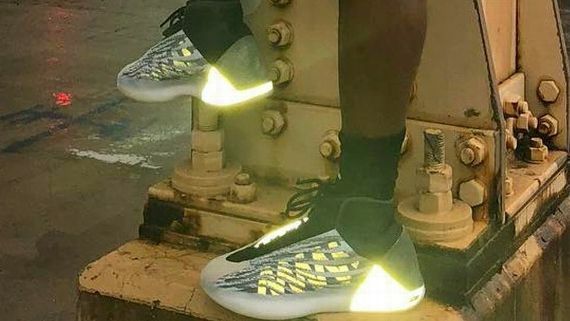 While the league office has yet to receive and formally review the new Yeezy basketball shoe in person, the version shared online by West would not be permitted on court as is, according to a source. Alternative versions of the sneaker that don’t incorporate the reflective material would likely be approved. The league has banned or issued warnings for several sneakers in its history, most famously Michael Jordan’s black and red Nike Air Jordan 1 sneaker in 1985. Nike almost instantly turned the buzz around the Bulls star’s banished debut sneakers into a marketing campaign, vaulting the signature series into rare air and sparking the dawn of collectible-sneaker culture. Three decades later, the Jordan Brand has become its own fully fledged subsidiary of the Nike Inc. company, with annual revenues topping $3 billion. In a recent post on his @KanyeWest Instagram, the Chicago native explained that his Yeezy basketball shoe has been in development for over three years and undergone nearly 300 sample updates. The new model is expected to finally make its much-anticipated debut during the 2018-19 season, with Adidas non-signature athletes like Donovan Mitchell, Brandon Ingram, John Wall, Kelly Oubre Jr. and Nick Young potentially wearing the shoe in early 2019. Retail release dates and a finalized price point have yet to be determined. Earlier Monday, during an interview with paparazzi in Los Angeles, West discussed his long-term vision for his collaborative brand with Adidas and his eventual goal to bring the manufacturing of his sneaker line stateside.